« Is Big Glass Really that much Better? When I’m composing an image, unless it’s an abstract design or just a texture, I think about what the subject is. You don’t always have to have one but I’ve always tried to convey at least some point of interest in the scene or compose the scene in such a way that it tells a story, however short or simple it may be. The basic rules of beginning photography suggest that the Rule of Thirds is a good starting point for developing interesting composition. But as I have stated before, in my tips, once you get beyond the basics, it’s worthwhile to break these rules creatively. In the image below, the subject’s head is just outside the upper right node but he is looking into the image, along the line formed by that node and the lower left one. Also, the light rays follow along that same path. Likewise, the magenta keyboard, which grabs your eye immediately, lies along that same path and is at the lower left node. So this image looks pleasing and was simple to compose. An image composed using the rule of thirds. Click for larger image. So, back to breaking the rules. Can you have a subject that is outside the frame? Certainly! When I’m shooting live music, I often try to capture the setlist just so I know what songs were played during the show. These lists are often taped to the stage in front of the performers or on stage equipment. When shooting this one, an uncropped image, I was in a position to make an interesting scene out of it, something that is not always possible. Scene where the subject is almost completely out of the frame. Click for larger image. But rather than shoot while the guitarist was in the frame, I waited until he stepped out of it almost completely, but just enough to convey his important role in the scene. 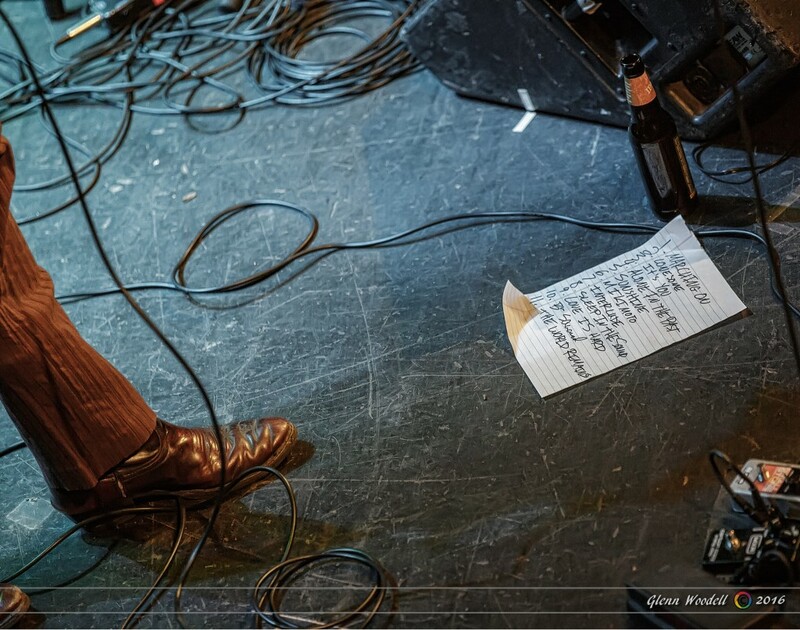 With the one dominant foot, and just a hint of the other, both pointing toward the setlist, it makes him the point of interest of the image even though we see very little of him. 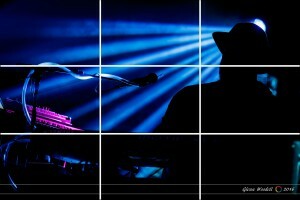 The setlist itself is set along one of the lines of the thirds and the performer’s foot does point toward one of the nodes of the thirds grid, further making this a pleasing composition without being quite so obvious. When composing in-camera, I don’t really think of the thirds but rather I will see a scene, even before I raise my camera, that looks pleasing to me. That pleasing scene may present itself along the lines of the thirds but I don’t consciously think of it that way. I think this has come from many years of shooting and developing my own style. Again, the rule is only there as a guideline because it works so well by default. It’s your job to find fun ways to break it.